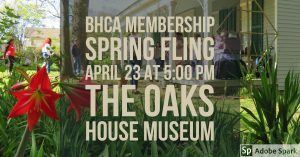 Please join us soon for wine on the lawn of The Oaks House Museum. You’ll have an opportunity to pay your 2019 membership dues, visit with fellow neighbors, and discuss project ideas for our neighborhood. This will be a very casual gathering and children are welcome. Special thanks to The Oaks House Museum for hosting and to Kats Wine & Spirits for donating the wine.